"My mom came up with this recipe when I was a child. It is the ONLY way I will eat green onions." 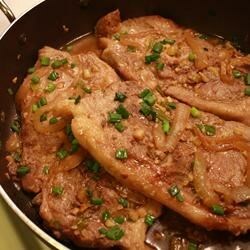 Learn how to make juicy, tender pork steaks with soy sauce and scallions. Great easy tasty perfect dish! As for "NASCARbaby" review 3stars they created their OWN recipe here and reviewed it not the given recipe I think it should not be included in the reviews! I used regular onion and it was really good!